Red Arrow Represents (Metal on Metal) Bracketed System where Stress Points exist and where failure and Leaks start to occur. Introducing some important Facts about the 'OLD ART' Conventional Helical Spiral Wrap Tubing, where the Housing creating Enormous Energy Loss. This is where the Manufacturer is Struggling to bring stability to the Coil by Dangerously Imposing Metal Brackets connected to the Outside Casing as well as individual Layer Tubing. Expansion and Vibrations will eventually give way anytime to Leaks and at the worse time, right in the middle of your Cleaning Job! I would like to make a Public Announcement to all you Carpet Cleaners with Older Prochem Truck Mounts Like the Performer 405, Bruins, Legend Trailblazer, Lancer, Saber, Saber 2000, CubXL, Blazer Plus & XL Etc,..........Prochem NO LONGER MANUFACTURES these Heat Exchangers confirmed by Chuck Coffey & Greg Ingalina Service Reps at Prochem in Arizona. Blue Baron Manufacturing so far has sold 100s of these Prochem After Markets with Proven Testimonials and with Great Success. 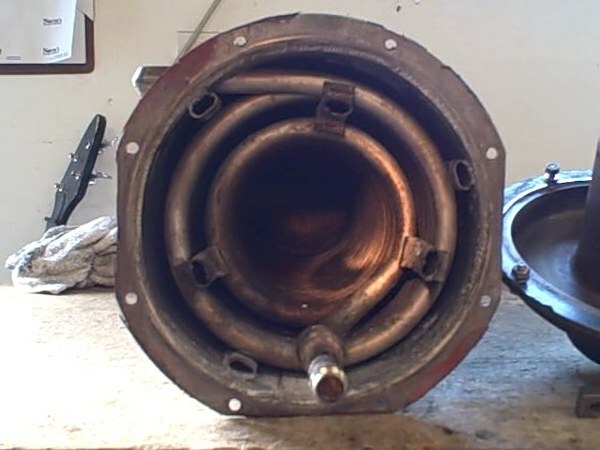 So, do not Panic, we will be the Rescue Team to all that are stuck with a broken Heat Exchanger. Our "One and Only" Patented Axis Point Heat Exchanger last longer and performs better than the "Old Art" Discontinued Prochem Heat Exchangers. We are the ONLY source in the US and abroad that fabricates these Prochem After Markets. Prochem has been sending referrals to us on a Weekly Basis. Visit our Online Store at the Link below.